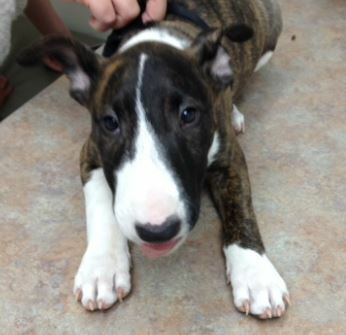 Bull terriers are a fun breed, full of personality. Unfortunately, they are prone to a few skin problems. Name the most common skin conditions seen in this breed. Thankfully, this cute little puppy had healthy skin. Mange caused by the demodex mite. (I see this mite causing problems in puppies from many breeds). Solar dermatitis as well as cancer – Any dog with white hair and pink skin is prone to sunburn and eventually cancer from sun exposure. I have removed many hemangiomas, hemangiosarcomas and squamous cell carcinomas from dogs who love to sunbathe. Source: -Foil, Karen. Breed-Related Dermatoses. VIN Dermatology Folder.